This magnificent antique Victorian sterling silver tea tray has an oval shaped form. The surface of the tray is encircled with exceptional bright cut engraved decoration depicting two oval and six circular scrolling leaf and circular motif bordered panels paralleling the incurved shaped border. Each panel is separated by a stylised leaf motif and depicts a fine and impressive alternating floral spray design and fruiting ornamentation, in addition to floral and foliate designs to the lower portion. The decoration to the surface of the tray incorporates a shaped vacant cartouche to the centre. The raised incurved border of the tray is encircled with fine and impressive chased husk ornamentation above a band of bead decoration. The shaped rim of the tray is embellished with an impressive applied bead decorated border incorporating chased leaf motifs to each lobe and incurve. This exceptional example of antique silverware is fitted with a fine and impressive, large pair of handles ornamented with chased decorated leaf terminals and a central leaf motif. The tray is fitted to the underside with four plain bun style feet. This magnificent tea tray is the finest example of its type you could hope to acquire. 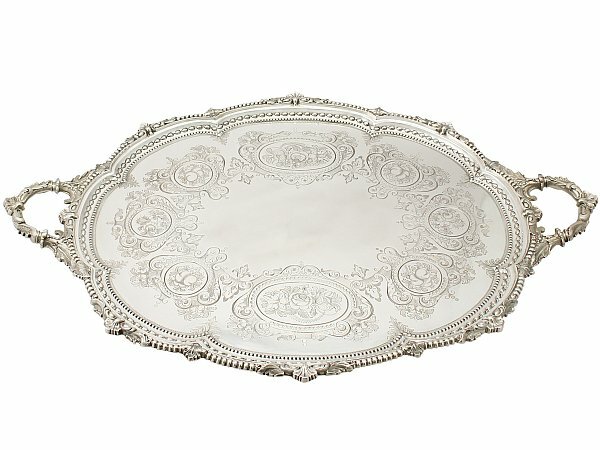 This antique tea tray is an exceptional gauge of silver, exceptional quality and in exceptional presentation condition. The chased and applied decoration is very sharp and the bright cut engraved decoration is very crisp. Full hallmarks struck to the underside of the tray are all very clear. Height to top of rim 2.8cm/1.1"